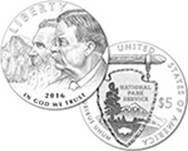 Description: features John Muir and Theodore Roosevelt with Yosemite National Park's Half Dome in the background. Inscriptions are "LIBERTY," "2016" and "IN GOD WE TRUST." Description: features the National Park Service logo. Inscriptions are "UNITED STATES OF AMERICA," "E PLURIBUS UNUM" and "$5." Description: features Yellowstone National Park's Old Faithful geyser and a bison. Inscriptions are "LIBERTY," "NATIONAL PARK SERVICE CENTENNIAL," "IN GOD WE TRUST," "1916" and "2016." Description: depicts a Latina Folklórico dancer and the National Park Service logo, representing the multi-faceted cultural experience found in America's national parks. 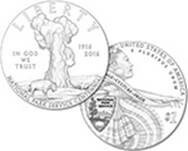 Inscriptions are "UNITED STATES OF AMERICA," "E PLURIBUS UNUM," "$1" "HERITAGE," "CULTURE" and "PRIDE." Description: features a hiker discovering the majesty of the wilderness and a small child discovering a frog hiding in ferns, celebrating the diversity and breadth of the National Park Service. Inscriptions are "LIBERTY," "2016," "IN GOD WE TRUST," "1916" and "NATIONAL PARK SERVICE." Description: features the National Park Service logo. 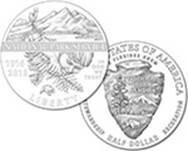 Inscriptions are "UNITED STATES OF AMERICA," "E PLURIBUS UNUM," "HALF DOLLAR," "STEWARDSHIP" and "RECREATION." Copyright © 2007-2013, National Park Hospitality Association. All Rights Reserved.